‘A real milestone for Northumberland’ with reduced housing numbers and up to 15,000 new jobs – that’s the sell for the county’s new Local Plan. Published in draft today ahead of a public consultation starting in early July, the development framework covers key issues such as housing, employment and infrastructure for the period from 2016 to 2036. It has taken less than a year to produce this key document following the new Conservative administration’s decision to withdraw the core strategy – a major element of the Local Plan – last July, largely due to concerns the housing figures were too high. This was not without controversy and the Labour opposition has continued to question the motives behind this move as well as its ramifications, while it was also referred to among the recent explosive – but refuted – allegations directed at the council’s leadership by developer Lugano over its Dissington Garden Village project. Today, council leader Peter Jackson again asserted that the withdrawal was the right decision and backed the new plan which ‘will make Northumberland a great place to live, work and visit’, the county ‘no longer going to be the developers’ friend’. The new plan aims to ensure that all communities are supported by adequate services and facilities including housing, education, transport, health, social care, sport and recreation. It includes policies and proposals to create up to 15,000 new jobs in the county – a quarter in dedicated industrial estates and office parks, but the majority in town centres or more rural locations. Housing numbers have been much reduced from the previous plan with 17,700 proposed over the plan period, or 885 a year, down from 24,000 after consideration of all of the up-to-date evidence on population growth and housing need. Policies will ask for a minimum of 20 per cent of all new homes to be affordable and make provision for accommodation with support for older people and vulnerable adults, for example in Extra Care accommodation. Coun John Riddle, the council’s cabinet member for planning, housing and resilience, said: “We don’t have any doubt that houses are needed in all sectors from executive to affordable. “We need housing right across Northumberland to support local services and our rural communities. We want to extend choice right across the whole county. The only green-belt deletions proposed in the new plan are for employment use on sites adjacent to existing businesses, for example, in Hexham, Ponteland and Prudhoe. 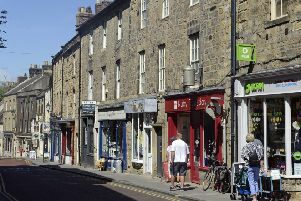 However, the Labour opposition, which was in power when the previous core strategy was drawn up and submitted, says the new plan is ‘so damaging to the interests of communities across Northumberland’ and that ‘the only hope young people will have of gaining access to decent job, a decent home at a decent price and a a place they can design a future for their children is to move to Newcastle or North Tyneside’. Labour leader Grant Davey said: “Not only are Coun Jackson and Coun Riddle ignoring serious allegations in planning, but now they are risking the sustainability of Northumberland. The draft Local Plan will be considered by the council’s communities and place committee next Friday (June 8) and the cabinet the following week. If approved, the consultation will run from July 4 to August 15.